We have exciting news! We are now making it easier than ever for you to buy PACLINE I-Beam Trolleys. They are now available to purchase directly online through amazon.com. When purchasing through Amazon.com you also have the benefit of FREE shipping. We are always striving to make the customer experience with PACLINE as efficient as possible and when we noticed the potential to make purchasing an in demand part easier and less expensive for our customers, we jumped at the opportunity! We currently offer two trolley sizes: 1/4 Ton capacity and a larger 1 Ton capacity. Our hand-pushed overhead beam trolleys are constructed of rugged cast iron. The side guide rollers on the trolleys prevent unnecessary wear on the track and trolley as well the wheels are bolted style allowing for fast and easy replacement. The PACLINE trolleys are expandable to various I-Beam and rail sizes and can be used in straight or curved monorail conveyor designs. These beam trolleys are suitable for carrying a wide range of equipment such as, but not limited to: power tools, doors, hoists, welding apparatus, cables, etc. Know the size and type of beam or monorail that the trolley will be placed on. If you follow these steps then you will know which capacity trolley to use in your operations. Overall we are excited to see the results of our new on-line ordering venture and hope that it allows customers to get these products faster and and at a lower overall cost than before! When you check out our online shopping page we would love to hear feedback or even your experiences with using Amazon to purchase or sell products! 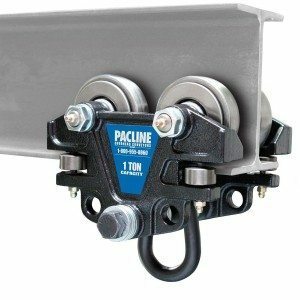 You can find all the details and product specs for our PACLINE heavy duty beam trolleys by visiting the button below. And remember, orders through Amazon.com will be shipped FREE of charge. If you have any questions regarding the selection of trolleys for your particular system or application, or any other questions or comments please feel free to contact us!